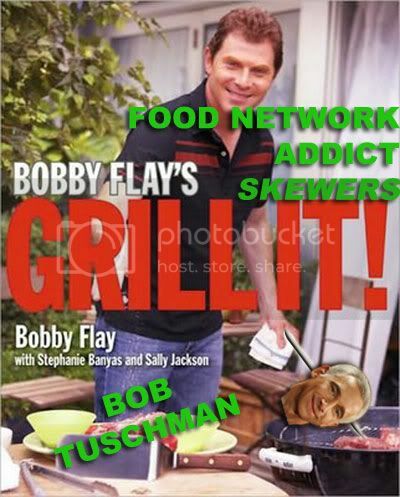 Thanks to those of you who let me know about Bob Tuschman's shoutout on his blog to Food Network Addict. I have an RSS feed setup for him, but nothing is coming up! Anyone else having the same problem? Anyhow, it's nice to hear that Bob finds me a "wickedly funny and perceptive critic of the network," but it was his comment that I often "skewer" the network and Bob that really got me thinking. Have I been skewering? Am I a skewerer? I like to think that I'm just pointing out things that might resonate with other viewers. Trust me, I realize I'm just one person and I don't ever claim to speak for the entire viewership. Still, it's nice to know that Bob is reading. Thanks Bob! I got to Chicago safely last night. It looks like the weather will be pretty nice this weekend, so I gotta get out and enjoy it. That also applies to TV shows. Just remember: the worst show on Food Network is someone's favorite show. Doesn't mean we can't criticize it, but try to put things in perspective, peeps. It's not just "BOB'S FAULT!" as the comments section on his blog appears to be turning into--a dumping ground for complaints. Okay, Chicago... going to get some pizza. I had the same problem with Bob's RSS feed. I got the first post, and then nothing else. I hope he fixes it, because I'm having problems seeing the "new and improved" Food Network site on my old computer. I'd really like to read Bob's Blog through Bloglines. If anything, you've increased my appreciation for the Food Network. Tuschy knows this, he's just doing his corporate "due diligence". Keep up the great work. Finding Bob's Blog is quite the challenge. Where in heavens name is it listed on the FN homepage ? As for Tuschie's due diligence, his blog looks like he has underlings attenf it for him. If skewering is giving your honest opinion, criticism, or critique of a show or personality, then, yeah, I guess you are skewering. But IMO, you do often "point out things that might resonate with other viewers". Not everyone agrees with everything you have blogged about -- me included. But it frequently makes for lively & interesting dialogue and it keeps me coming back. The only reason I watch the drivel on Food Network is because of you and your blog Food Network Addict. I read Bob's blog on its premier and had throw up in my mouth before I finished reading it. I am serious, I look at food network addict and then I turn on the tv to Food Network. So you are the bomb, Bob isn't anything compared to your genius insight and somewhat unbiased attention. Bob gives you a nice compliment and suddenly he's a cool guy and it's not his fault! lol. Kidding, dude. He seems like a nice enough guy, but I still think he was inconsistent and melodramatic on TNFNS. His job isn't easy. If this site proves anything, it's that FN fans are HARD to please. And change makes them fire up pitchforks and rush out in an angry mob. You know it is so OVER for Bobby Flay. This new show I saw this morning SO BORING!!!! Sick of all the grilling crap. AND his stupid shows competing for us everyday cooks. PLEASE SO BORING!!!!!!! Thank you for you blog Jacob! I don't believe for one second that a FN EVP (or any other EVP) touches a keyboard, with the intent of releasing those keystrokes to the public. Not one minute. There is absolutely no way Tuschman is doing the actual blogging. The blog will eventually be slanted to favor the FN, although they are allowing some critical stuff to go up in the first week or so, but watch the transformation. And watch for astroturfers or shills thaT will post stuff in a very favorable FN light. Again, FN taking with liberties with our intelligence. Do you FN asshats think we are stupid ? You think you can outthink and bluff smart savvy bloggers ? Think again Scripps Monkey people. Tuschman you are a complete idiot. It's true, there's no way someone at Tuschman's level is reading actual blogs, let alone writing them. Anonymous 10:19 has it exactly right. And it's likely that what appears to be any sort of balance will disappear quickly. But Tuschman's clearly not an idiot, lots of people obviously assumed he was writing the blog, didn't they? Me hate Bob Tuschman, He bad. Bad man. Me much more indelligent. Me too imbarassed to own my stubitity by using my real fake name. Martha Stewart has a blog and a blogger that writes for her. Either the blogger writes exactly like her or Martha edits heavily as it's very Martha-esque. People are easy to imitate if paid correctly. Jacob, come back to Chi-town for the Common Threads benefit on October 29th! Top Chef Stephanie and others from the show will be cooking.